Ready-made solution to the problem of D3 Option 21 Reshebnik on theoretical mechanics (termehu) Taskbook Targ SM 1983. 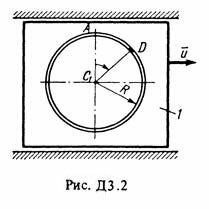 The mechanical system consists of a rectangular vertical plate 1 m1 = mass of 24 kg and the weight of the cargo D m2 = 8 kg; stove or moves around a horizontal guide (Fig. D3.0, D3.4), or rotates around the vertical axis of the z, lying in the plane of the plate (Fig. D3.5, D3.9) At time t0 = 0 the load starts to move under the the action of the internal forces on the existing plate at the trough; law of motion s = AD = F (t) is given in Table. D3, which is expressed in meters, s, t - in seconds. The form of the trough in Fig. D3.0, D3.1, D3.8, D3.9 - straight (KE trough) in Fig. A3.2-D3.7 - a circle of radius R = 0.8 m centered at the center of mass of C1 plates (s = AD in Figure A3.2 -. D3.7 is measured by the arc of a circle). Stove (Fig. D3.0, D3.4) is the time t0 = 0 the velocity u0 = 0. Plate (Fig D3.5-D3.9) has at time t0 = 0 the angular velocity ω0 = 8 s-1, at which point it starts to act on the torque M (moment about an axis) specified in the table in newton and aimed both at ω0 M> 0 and in the opposite direction at M <0. z-axis runs from the center C1 plate at a distance of b; Plate dimensions are shown in the figures. Assuming loads of material point and ignoring all resistances, determine shown in the table in columns 4 and 9, where indicated: in the column 4 (refers to Figure D3.0, D3.4.) X1 - the movement of the plate during the time from t0 = 0 and t1 = 1s, u1 - plate speed at time t1 = 1, N1 - plate full force of normal pressure on the guide at time t = 1 (point where the force is directed); 9 in the column (referred to Figure 5-9.) ω1 - angular velocity of the plate at the time t1 = 1, ω = f (t) - the angular velocity of the plate as a function of time. In all the figures cargo izoobrazhen in a position where s = AD> 0; for x <0 the cargo is on the other side of the point A. Right after the payment you will receive a link to a zip-archive with the solution of D3 Option 21 on the theoretical mechanics of manuals SM Targ 1983 for part-time students (Reshebnik Targa 1983). The decision is made by the methodical instructions and control tasks for part-time students of thermal power, mining, metallurgy, electro-instrument-making, automation and technological specialties universities. The decision is decorated in WORD format. Please leave your positive feedback after the test solution. Feedback can be left at any time by clicking on the download link.